This item, written by Reverend Samuel M. Irvin, contains Irvin's thoughts on Thomas Jefferson "TJ" Sutherland. Sutherland, also known as General Sutherland was, according to the information that he gave Irvin, held prisoner by the British following the burning of the "Caroline" on the Canadian border in 1837. 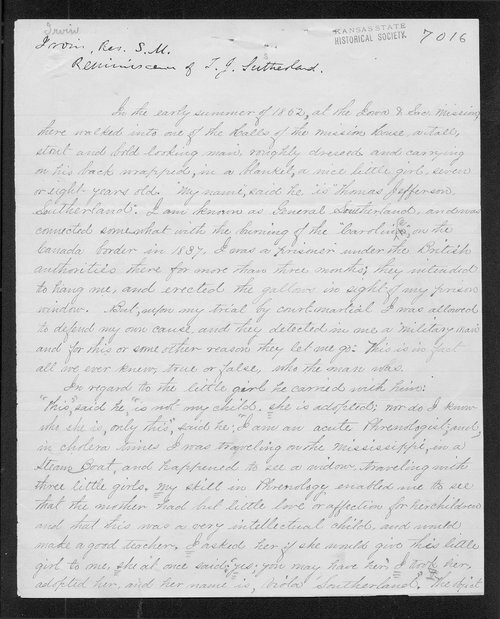 Irvin explains that Sutherland intended on forming a group in order to move "west of the Indian reserves" but was unable to complete the task due to the fact that he died after a lengthy sickness. Call Number: Samuel Irvin Coll. #403, Box 1 Folder: Miscellaneous papers.